The SS-169, U.S.S. Dolphin was the sixth U.S. Navy vessel to bear that name. She was launched at the Porsmouth Navy Yard on 6 March 1932, sponsored by Mrs. E.D. Toland. Lieutenant J.B. Griggs placed her in commission on 1 June 1932. Sailing from Porstmouth on 24 October 1932, Dolphin arrived in San Diego on 3 December, where she joined SubDiv 12. She remained on the west coast until 4 March 1933, when she departed San Diego to return to the east coast. She arrived at the Portsmouth Navy Yard on 23 March for final trials and acceptance. From 1933 through 1937, Dolphin was home ported in San Diego, making occasional voyages to Pearl Harbor, Alaska, and the Canal Zone. On 1 December 1937 Dolphin departed San Diego for Pearl Harbor, which was to be her new home port. Present in Pearl Harbor during the Japanese attack on 7 December 1941, Dolphin returned fire with her machine-guns. Following the attack, she got underway to patrol the local Hawaiian area for possible enemy submarines. Dolphin‘s official first patrol commenced on 24 December 1941. During this patrol she did reconnaissance work in the Marshall Islands in preparation for later air strikes. She returned to Pearl Harbor on 3 February 1942. Following refit and repairs, Dolphin departed on 14 May 1942 to participate in the Battle of Midway. This was considered a special operation, rather than a war patrol. Her search area was west of Midway, and she patrolled off the island itself during the battle. After the Japanese defeat at Midway, Dolphin entered harbor there on 8 June for repairs, departing on 11 June for what would now be her second war patrol. Dolphin spent the next 68 days covering her patrol area. On 26 June 1942, Dolphin fired two torpedoes at what was estimated to be an 8,000 ton tanker. Results were undetermined, but she was credited with damaging the ship. This was the only one of her patrols that was designated as “successful” by ComSubPac (a “successful” patrol was one on which the submarine either sank or damaged an enemy vessel, or, in the case of some special missions, accomplished the designated task even if no enemy vessels were damaged). She concluded her patrol on 24 July at Pearl Harbor. Her third war patrol, from 12 October to 5 December 1942, was off the Kurile Islands. This was a reconnaissance patrol. Following her third patrol, Dolphin was withdrawn from active patrolling and assigned to training duties at Pearl Harbor. She performed these duties until 29 January 1944, at which time she sailed for the Panama Canal Zone. There she again participated in exercises, before returning to New London on 6 March 1944. At New London she was assigned to the Submrine School, serving as a school ship until the end of the war. Dolphin was decommissioned on 12 October 1945, at Portsmouth Navy Yard. She was sold for scrapping on 26 August 1946. 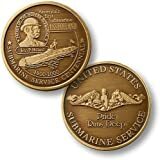 Dolphin received two battle stars for her World War II service.